The left bank of the Zvornicko lake (Zvorničko jezero) belongs to Bosnia and Herzegovina. It spreads along 25 km of the river Drina, while the width varies from 200 metres to 2-3 kilometres. The longest depth is 39 metres. On both sides there are woods surrounded by mountains. You can swim, fish, rent boats, row, walk in the nature. Each year, the last weekend in July, an international manifestation `Somovijada` (salmon) is held.It is a competition in making salmon chowder. Near Ljubovija there are remains of an old Turkish fortification – Soko grad (Falcon city) and a monastery – Saint Nikola. Accommodation can be found in hotels in Radaljska spa, 9 km from the lake, in private lodgings near the lake or in pile dwellings. 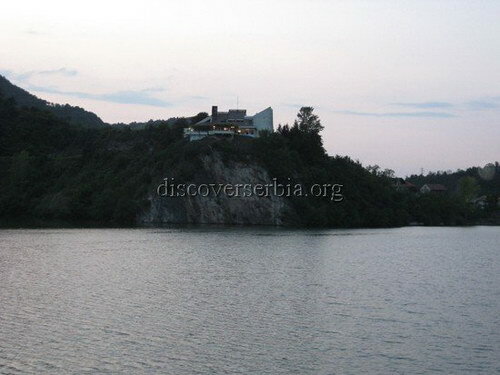 The left bank of the Zvornicko lake belongs to Bosnia and Herzegovina. It spreads along 25 km of the river Drina, while the width varies from 200 metres to 2-3 kilometres. The longest depth is 39 metres. On both sides there are woods surrounded by mountains. You can swim, fish, rent boats, row, walk in the nature. Each year, the last weekend in July, an international manifestation `Somovijada` ( salmon) is held.It is a competition in making salmon chowder. Near Ljubovija there are remains of an old Turkish fortification – Soko grad (Falcon city) and a monastery – Saint Nikola. Accommodation can be found in hotels in Radaljska spa, 9 km from the lake, in private lodgings near the lake or in pile dwellings.